A cervical cancer awareness event outside Blackburn Town Hall drew a terrific response from the public. 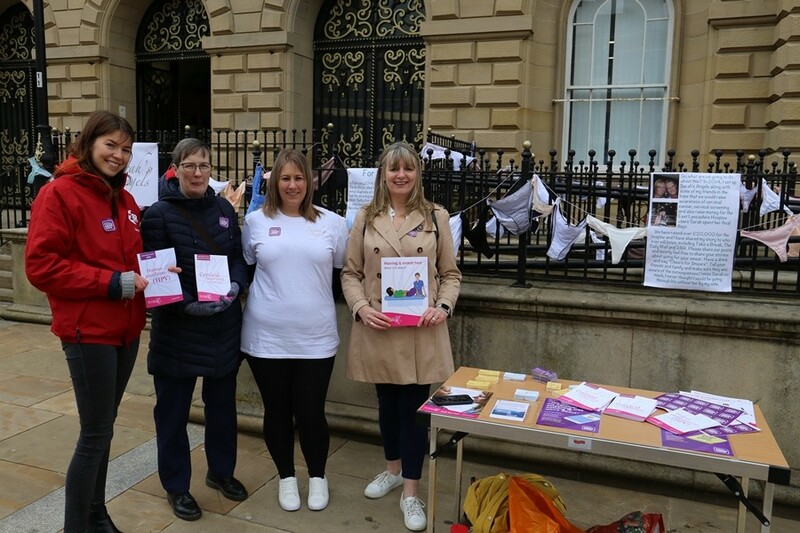 Blackburn with Darwen Council and 2BR hosted the event on Friday 22 March which saw 95 pairs of women’s knickers hung from the railings outside Blackburn Town Hall to visually and impactfully represent the amount of women from Blackburn with Darwen who’ve missed their cervical screening test. Figures from NHS Blackburn with Darwen CCG for the first quarter of 2018/19 show that, whilst 19,447 women aged between 25-49 were screened, just over 9,500 missed their appointment. So, 95 pairs of knickers hung from the railings to each represent 100 Blackburn with Darwen women. The date of the event also marked ten years since the passing of Jade Goody, one of the most high profile people in the UK to die due to cervical cancer. On the day Louise Turnbull from local charity Sarah’s Angels and nurse Rachel Carr – who has done thousands of smear tests in her job, joined 2BR reporter Laura Pratt and Blackburn with Darwen Councillor Julie Gunn to talk to members of the public about cervical screening. They explained how it works and that regular screening, which only takes a few minutes, can help stop cervical cancer before it starts. All the information leaflets that the team had on the day were handed out with women of all ages being spoken to as well as some men. Public Health England’s recently launched ‘Cervical Screening Saves Lives’ campaign. It was a fantastic event and a real talking point that drew lots of people in on the day. I was delighted to take part as we remain committed to talking about this across the borough and raising awareness about cervical cancer screening at every available opportunity. I was blown away with the response our campaign had on Friday, with so many people coming over and asking what we were up to. We managed to speak to women about to go for their first screening, along with women who go for theirs religiously, and men who went home to make sure the women in their lives were up-to-date. Some of the stories we were told show how important these smear tests are – despite the awkwardness you can sometimes feel going for it. And another great thing to come from this is that all the knickers from the day are now on their way to a women’s refuge in Blackburn, to help other women in need. Thank you again to everyone who came and spoke to us last week – please make sure you’re up to date on your screening too!